This week, 'Namgis First Nation, Ecojustice and Alexandra Morton won a case against the federal government. Essentially, the courts have concluded that Piscine Reovirus (PRV) from fish farms is a threat to wild salmon and that DFO is failing to protect them. Here are a few of the articles covering this important decision. The Federal Court has given DFO four months to amend its policy of not testing fish farms for piscine reovirus (PRV). Department of Fisheries and Oceans has four months to review their policy on Piscine orthoreovirus. Indigenous groups in Canada and the United States are calling for a study of how human activity has degraded the waters off British Columbia's coast before any new vessel traffic is allowed in the area where port and pipeline activities are on the rise. Commercial salmon harvests have declined dramatically for all Pacific salmon species in British Columbia, mainly over the period 1995–2000. 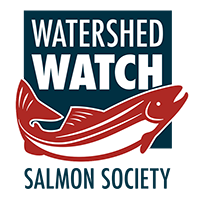 Research supported by Watershed Watch and others improves our fundamental understanding of the effects of acute stress on the physiology and survival of fish and can be directly applied to improving the welfare of bycatch fishes discarded from fisheries. A new study is the first to report microplastics in a groundwater source that accounts for 25 per cent of the global drinking water supply. Watershed Watch's Lina Azeez explains our model restoration project on the Katzie Slough in Pitt Meadows. "Management and conservation efforts would be well‐served to consider actions that maintain such ecological variation to facilitate meta‐population persistence in a rapidly changing world." Whether studying Alaskan Brown bears, tracking Black rhinos or diving with Great White sharks, my work has taken me far beyond Fairfield County to explore the wilds of the Alaskan tundra, experience the beauty of the African savanna and ply the waters of the Indian Ocean. Aldo Leopold wrote a description of the Colorado River Delta in 1922. If he returned today, he probably would have to carry his canoe over a barren salt flat. Fishermen and fishing communities are often at the forefront of protecting marine habitats and resources. “Prior to 1905, electricity in the Greater Vancouver area was run on steam power,” explains Will Koop, who has extensively researched the history of British Columbia’s watersheds. Tla-o-qui-aht First Nation and Central Westcoast Forest Society working to revive Tranquil Watershed. Crews race to rescue First Nations artifacts dating back thousands of years and paleontological evidence from the beginning of time. For World Wetlands Day, Ted Lightfoot created a weatherproof mural of an orca. According to a new research at the University of British Columbia, total CO2 emissions from the industrial fishing sector in 2016 stood at 159 million tonnes. A proposed Surrey coal shipping project that had drawn sharp criticism from environmentalists and some local governments has had its permit cancelled by the Vancouver Fraser Port Authority, effectively killing the project. WATCH: As the U.S. government approves the killing of sea lions in Washington State and Oregon, a B.C. group is hoping for a green light to harvest thousands here. UNESCO warned two years ago that the park was in danger of losing its World Heritage status owing to poor management. A University of New Brunswick scientist working on a contentious Miramichi salmon stocking program admits it cannot proceed without backing of First Nations groups. On November 5, 2018, Irving Pulp & Paper (Irving) was ordered to pay a penalty in the amount of $3.5 million for three offences under the Federal Fisheries Act. In the extended families that make up the pods of endangered Southern Resident Killer Whales, males may be the primary hunters for Chinook salmon while females raise the young, according to a study published Monday. 1.3 million chinook salmon will be released in Alaska's waterways in 2019 by the William Jack Hernandez Sport Fish Hatchery in Anchorage. Michigan students are getting an inside look at the outdoors by raising salmon inside their classrooms. Rogue River spring Chinook salmon populations are plummeting and Steve Beyerlin, a lifelong fishing industry professional, wants something done about it. In the Bristol Bay Watershed, a First Nation's traditional culture and way of life faces potential devastation. New research is giving scientists insight into how the endangered Southern Resident Killer Whales hunt for salmon, and that information may help humans save the whales from extinction. Contrary to expectations, commercial catches of Pacific halibut were increased in all but one Alaska region. Genetically engineered salmon should be labeled as such when they’re sold to Americans at supermarkets across the nation, according to Alaska’s U.S. senators who hope to make the phrase law. Activists say hydroelectric power projects, dumping of industrial waste, unregulated urbanisation and tourism and illegal sand and stone mining are going on near Himalayan rivers without any planning, environment impact assessment and carrying capacity studies. Find out why whales and dolphins get entangled in fishing gear and discover the people working to save them. Support the Salmon News. Donate today.